For our December interactive board I had big plans, but time got away from me, sorry. I came up with a cute one, mostly for decorating purposes, although it does include a fine motor skill activity. For the board I had our wonderful room helpers trace all the children's hands. 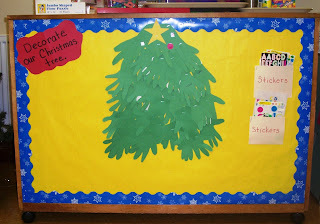 We used the hands to create a Christmas Tree on the board. Next to the tree I placed two pockets filled with all those sticker sheets you have around, but never quite finished. 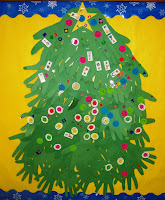 Then I told the children to help decorate our Christmas Tree with all the stickers. We just started so there aren't many decorations yet, and we still have one class of hands to add. It should look great when it's finished. My actual plan was to make some different colored Christmas stockings along with different colored pictures. Then I was going to have the children match the presents to the correct stocking, color matching. I was going to have Velcro on the outside of the stockings and make three presents per stocking, but, maybe next year. I'll keep an eye to watch out the finished shape.